It&apos;s a really good phone. For someone who isn&apos;t very good or fond of technology it&apos;s easy to use. Has great features and realisable functioning. Battery life after a certain point. The Nexus 5 overcomes one of the shortcomings of the Nexus 4 with support for 4G (LTE) and Bluetooth 4.0 support. There&apos;s NFC and Wireless charging built-in as well. Fastest phones of its time. RAM 2 GB is more than enough. Nexus 5 is one stop solution for those who weren&apos;t satisfied with nexus 4 model. Nexus 5 offers a whole new range of features. 5 Pricebaba users have written their experience with LG Nexus 5. If you own LG Nexus 5, please do leave your feedback too. The Nexus 5 is an LG-manufactured flagship phone from Google in 2013. It improves upon its predecessor, the Nexus 4, in many ways. Starting with the display  its got a 4.95-inch 1920 x 1080 pixel Full HD IPS panel covered with Gorilla Glass 3. Thats a whopping 445 PPI pixel density. The phone was so popular among the masses that Google worked with LG again to make the Nexus 5X as a tribute to the Nexus 5. It is powered by the latest-and-greatest Qualcomm Snapdragon 800 quad-core chip grunting at 2.3 GHz with an Adreno 330 graphics chip. Theres 2GB of RAM onboard and the Nexus 5 comes with either 16 or 32GB of internal storage (as with all recent Nexus handsets, theres no microSD card slot). Connectivity-wise, the Nexus 5 overcomes one of the shortcomings of the Nexus 4 with support for 4G (LTE) along with the latest WiFi 802.11ac and Bluetooth 4.0 support. Theres NFC and Wireless charging built-in as well. In the camera department, the Nexus 5 sticks to the same 8 megapixel resolution of the prior model, but adds Optical Image Stabilization (OIS). Google also touts HDR+ which takes better High Dynamic Range images and Googles automatic image editing features. The phone also packs new sensors apart from the typical motion and light sensors; that include sensors for pressure and hall effect. Powering the Nexus 5 is a non-removable 2300 mAh battery. 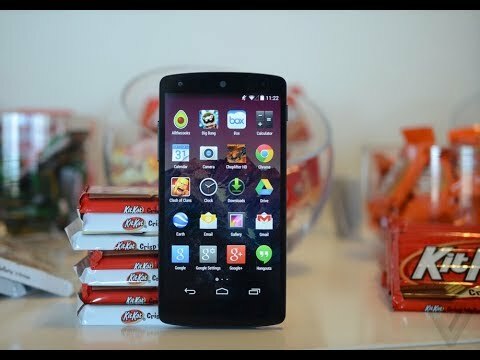 Lastly, the Nexus 5 comes with the brand new Android 4.4 KitKat which, other than feature additions, is optimised to use less resources than before. This is the 16GB variant of the Nexus 5.